The MemScan gives you insight on the remaining lifetime of your X-Flow modules and offers the clarity you need to allocate the budgetary means in a timely manner to implement a properly phased replacement plan. 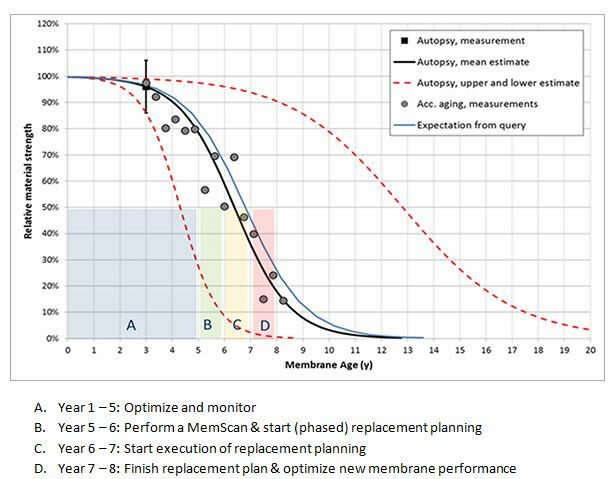 The aging of membranes is inevitable, but the aging speed depends on many external factors, including temperatures, pH, coagulants, and the levels of exposure to chemicals. Certain combinations of these factors may work as a catalyst for increased aging speed. The MemScan also tells you what is causing most damage to your membranes, and helps to select the right cleaning agents. Detailed knowledge on membrane fouling and the causes of performance loss will help to prevent further damage and unnecessary production stop. The MemScan monitors the physical condition of your membranes to determine the best time for replacement. The ultimate goal is to prevent problems, and to achieve this we examine one of your modules. The first step is a visual inspection, in which the module casing and general condition is recorded. An integrity test detects possible leaks and marks them for further examination. The second step comprises the actual membrane examination. The module casing is removed and several membranes are selected for detailed inspection. Numerous fibers will be tested for permeability, mechanical strength and fouling levels. The resulting values are compared with the original batch figures. More detailed information on the morphology of the membrane’s inner and outer surfaces is gained with SEM analysis (Scanning Electron Microscopy). The elemental surface composition, as well as fouling on elemental and particle level, is identified with EDX analysis (Energy Dispersive X-ray). An optional intermediate step is the cleaning test. Based on the EDX analysis, it assesses the effectiveness of different cleaning agents. The final step in the MemScan is the remaining life expectancy test. This test uses the mechanical strength, module age and your specific plant settings and feed characteristics to produce the best possible indication of the expected remaining lifespan. Learn more in the MemScan leaflet.